I recently came across an interesting book: My First Ladies, by Nancy Clarke. In this slim volume, Nancy holds the reader's interest with little tidbits about her 30 years as the White House Florist, and her interactions with those first ladies. Starting with Rosalynn Carter, on to Nancy Reagan, Barbara and Laura Bush, Hillary Clinton, and finally, a few months with Michelle Obama. 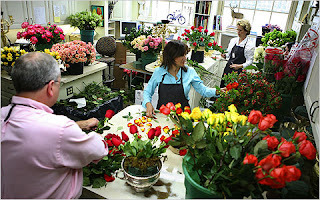 The White House has employed 'bouquet makers' since the 1850's. told of fresh flowers gracing the most elegant homes there. This heralded the end of the use of wax flowers, and the White House hasn't looked back since. 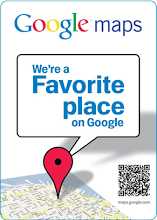 to other rooms when they are past their prime. Nancy started out as a volunteer in 1978, quickly moving up to Head Florist and working through 5 administrations. 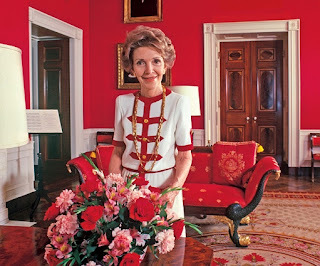 Nancy's patience and dedication are evident throughout the book, as she tells of the many long hours spent meeting with White House staff and the First Ladies themselves, each one having their own idea of what the White House flower arrangements should look like. It was Nancy's job to help each First Lady put her own stamp on the White House, while also maintaining a certain decorum. "Peonies bloom in May", as a gentle reminder. 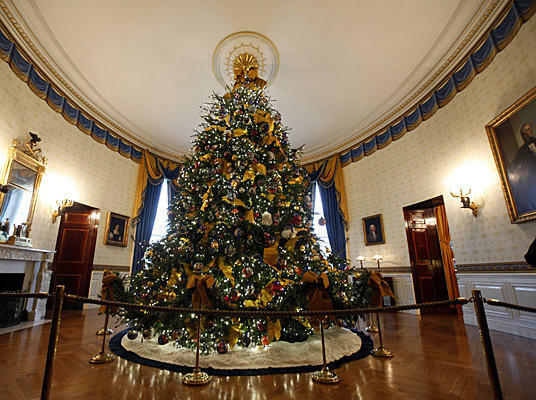 Decorating for the holidays is no small feat, and decorating the White House even more daunting, requiring an army of volunteers, and hundreds of man-hours of planning for Nancy and her staff. The First Lady would generally decide on the theme for the year, such as Mrs. Carter's "Antique Toys" theme, and then most everything else floral and decorative was left to Nancy to plan out and execute. 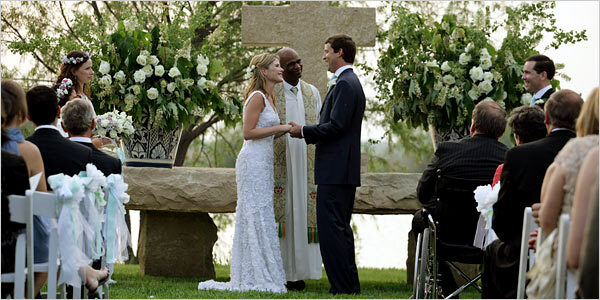 There were few weddings in the White House during Nancy's tenure, but she was asked to help with the flowers for Jenna Bush's wedding in 2008 at the family ranch in Crawford, Texas. 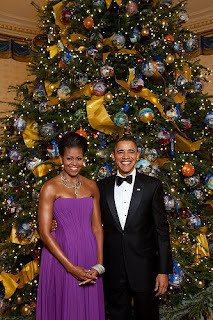 Flowers were selected in Washington and sent to the ranch for the big day, arranged there by Nancy and a team. 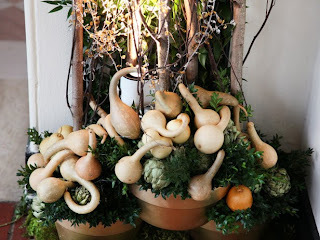 Jenna had requested a rustic but elegant look, which Nancy achieved using birch containers, roses and Hydrangeas. 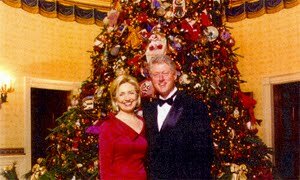 One big change brought about by a First Lady was Hillary Clinton. not the most convenient outfit for a physical job! so did the florists, and they all breathed a sigh of relief! 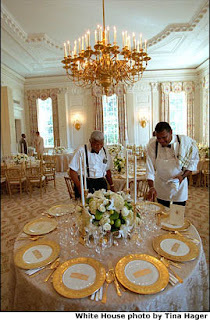 there were multitudes of dinners large and small to plan for visiting dignitaries, at times involving travel to Camp David, or flowers for Air Force One. 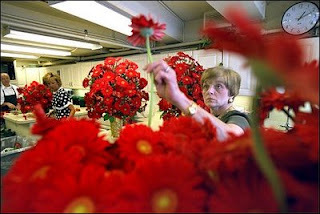 Here, the staff is shown preparing flowers for Queen Elizabeth's visit in 2007. You can see there wasn't much elbow room! 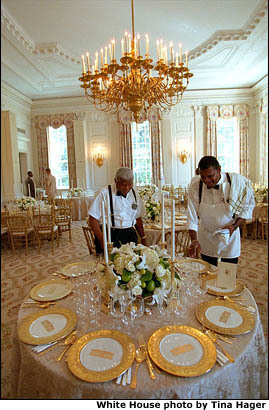 not to mention all the different patterns of beautiful White House china patterns, to work with! and a special touch that helped Nancy be considered family by all her First Ladies. Baby's Breath-Love it or Hate it?